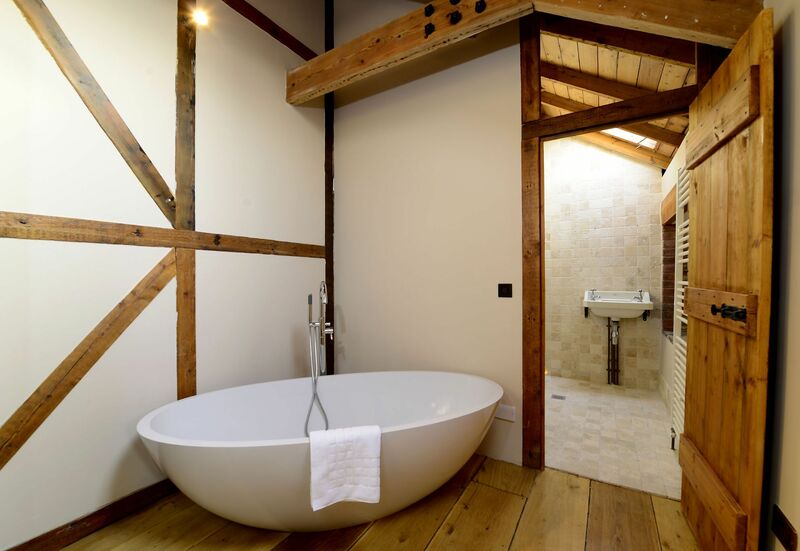 An amazing barn conversion, with charming features and elegantly furnished throughout, beautifully done with great attention to detail. 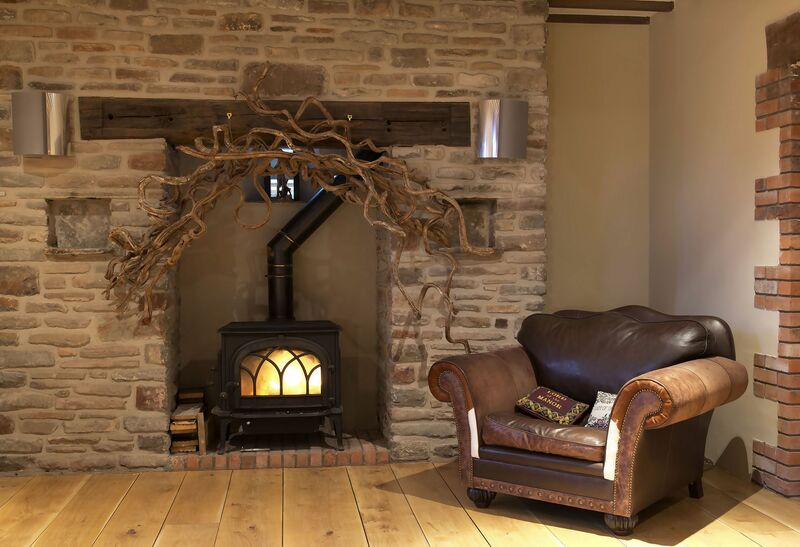 The two sitting rooms feature stripped oak flooring throughout, roomy, “sink-in-to-them” sofas, wood-burning stoves and wide-screen TVs. Music system throughout the house and garden. 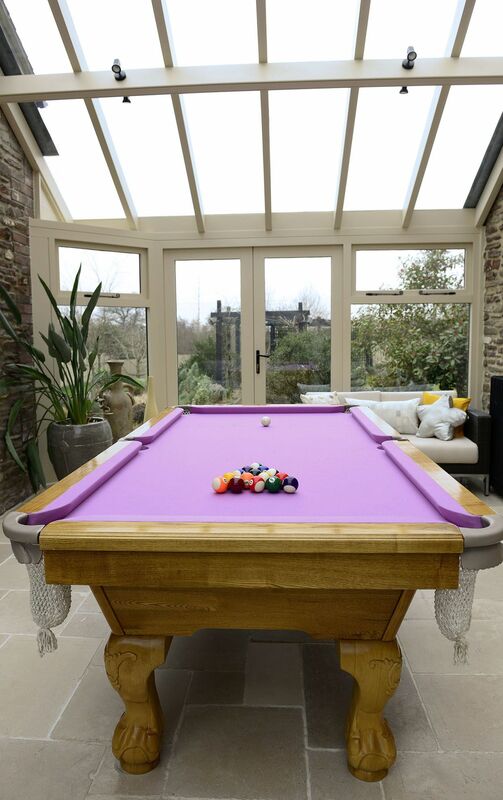 Games room with pool table and bean bags. 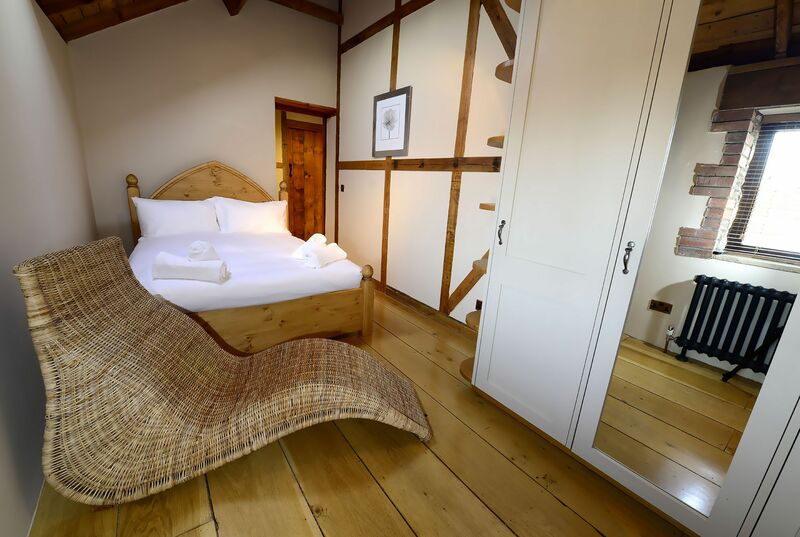 Cosy bedrooms are all en suite and have an almost alpine lodge quality to them, with their warm, wooden panelling, tactile bed linens and full-length windows, offering unbroken views across the surrounding countryside. Relax in the indoor jacuzzi, or take a dip in the indoor swimming pool, both of which are heated the whole year round. 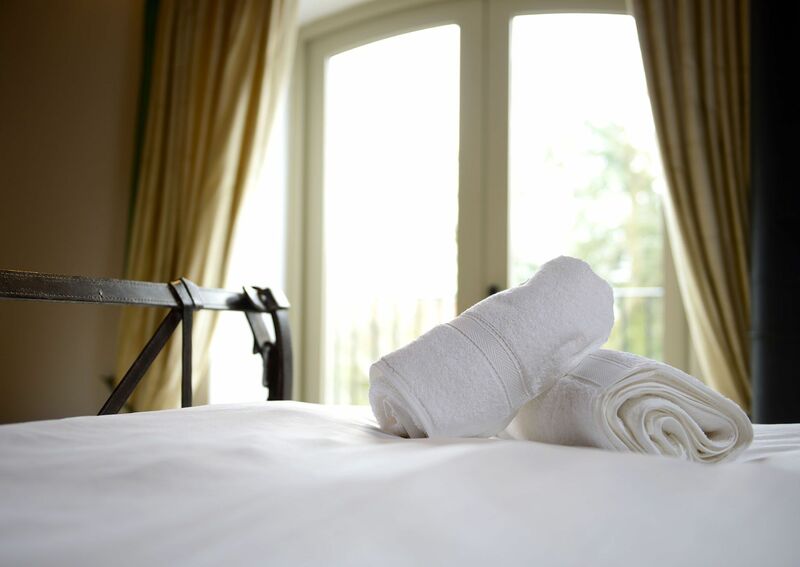 Henfield Barn can provide some luxurious add-ons that add a bit of extra sparkle to your stay. You can even hire your own private cocktail bartender for your celebration. 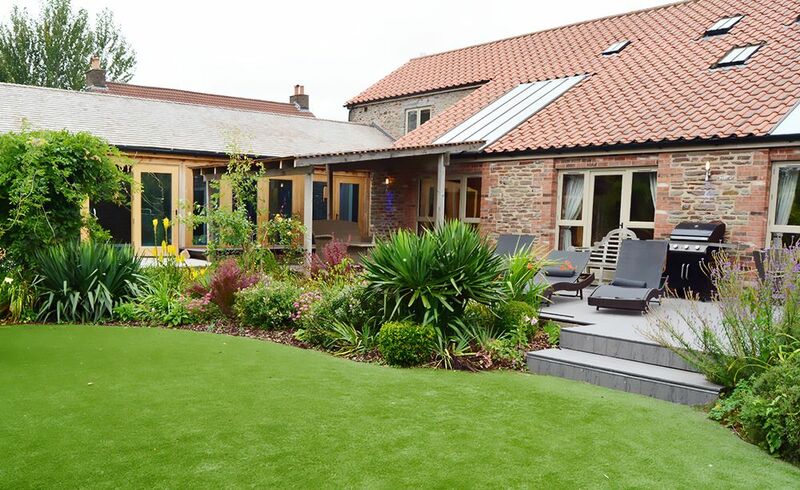 Surrounded by green space – including the acclaimed Kendleshire Golf Club, a stone’s throw from the property – and enjoying its own pretty, landscaped gardens. 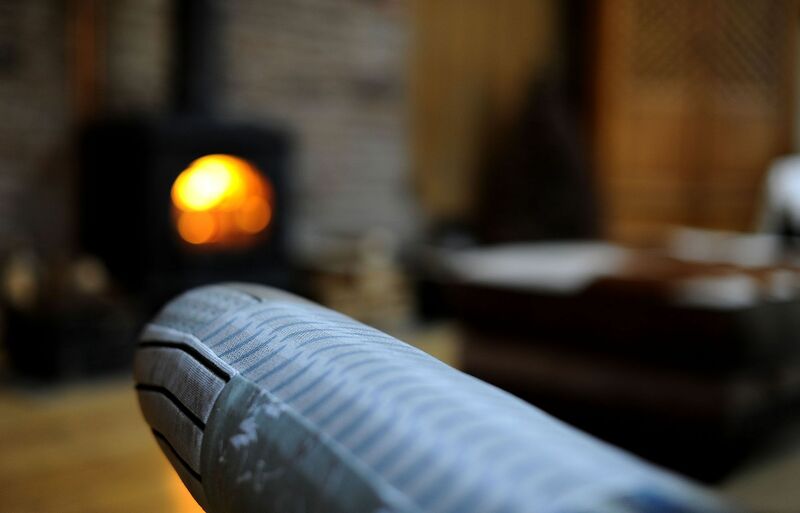 The ideal setting for Autumn and Winter breaks, a New Year gathering or Christmas morning with central heating, an AGA, wood burning stoves in both living rooms, a Jacuzzi heated all year round, in-house pampering treatments, a sauna and steam room and very comfortable beds. Kendleshire Golf Club has created some exclusive packages for Henfield Barn, offering Guests to enjoy this impressive 27-hole course, as well as two other nearby courses, at very special rates. The Folly pub restaurant is less than a mile (about 15 minutes’ walk). 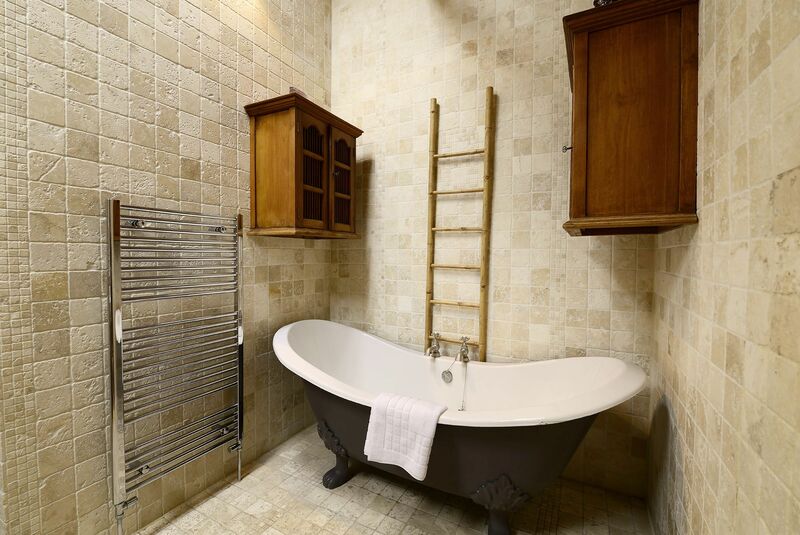 Within easy reach of the culture-rich cities of Bath and Bristol as well as the pretty unspoilt villages of Lacock and Castle Coombe, Badminton House, Westonbirt Arboretum and many National Trust properties. Kitchen Diner: A space that works perfectly for groups, providing a convenient layout that allows you to be sociable and cook at the same time. There’s plenty of room to move about in, plus ample worktop space, including island spaces that work well for informal eating. 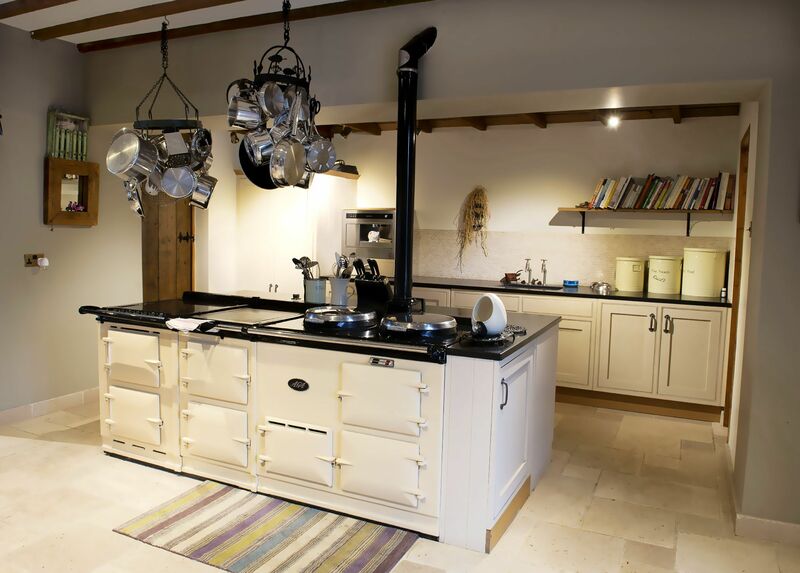 The country-style theme is enhanced with an AGA and shaker-style units, a deep Belfast sink, and expansive oak dining table. Oak beaming adds to the charm. With state-of-the-art kitchen utensils you’ll find everything you need to make your catering as convenient and pleasurable as possible during your stay. Main Living Room: Made for relaxation, featuring a deluxe, velvet corner sofa, liberally scattered with tactile throws and plush cushions and a wide screen TV. 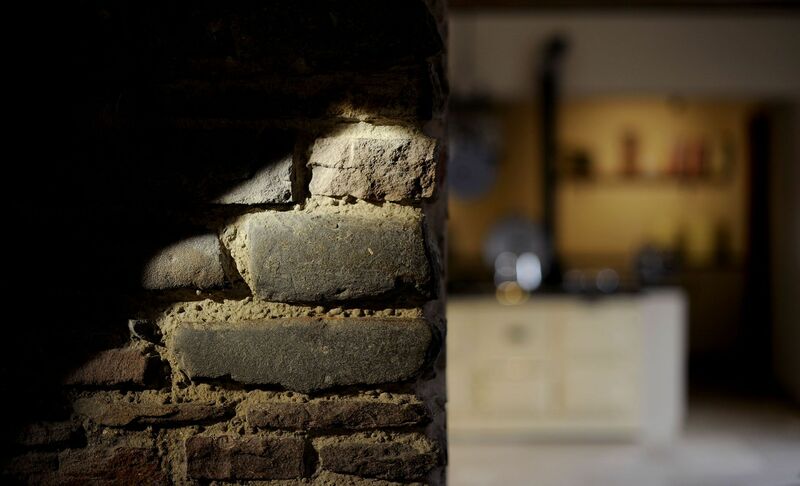 Natural sunlight streams through a bank of skylight windows while on colder days you can cosy up next to our wood burning stove, set against a wall of exposed stonework. During the summer months, open the patio doors wide and spill out into our pretty gardens, the perfect backdrop for enjoying a sundowner or two. 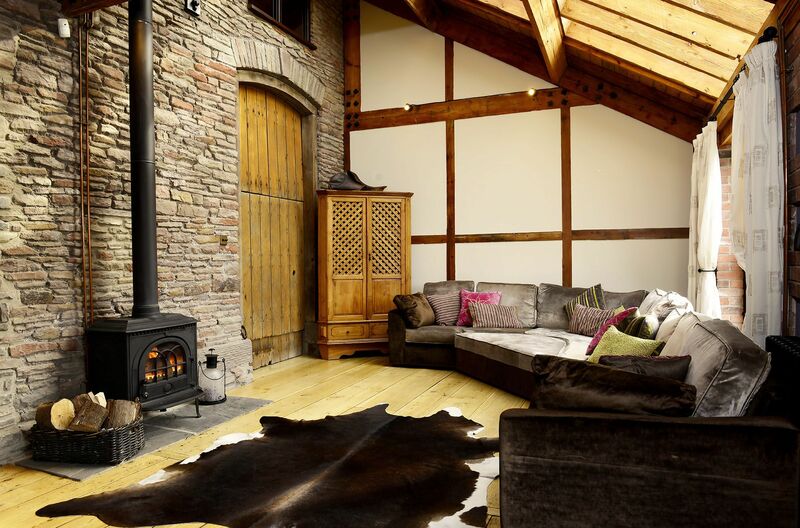 Second Living Room: An intimate, cosy ambience of a traditional country property, with its exposed beams and brickwork, and roomy, Chesterfield-style leather sofas. 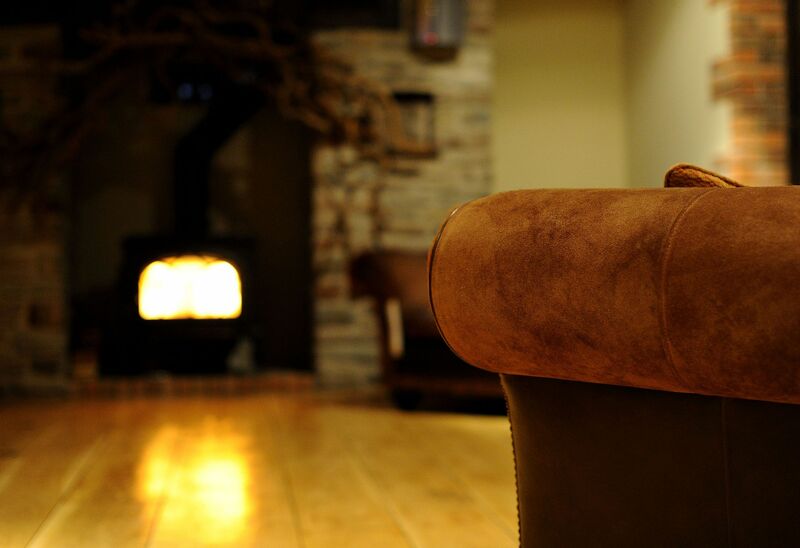 Boasting an additional wide screen TV, desk and wood burning stove, this room is the perfect place to curl up with a book, unwind with a tipple from our honesty bar or enjoy an after-dinner coffee. There is a step up to a dining area with a table which will extend to seat 15 guests. 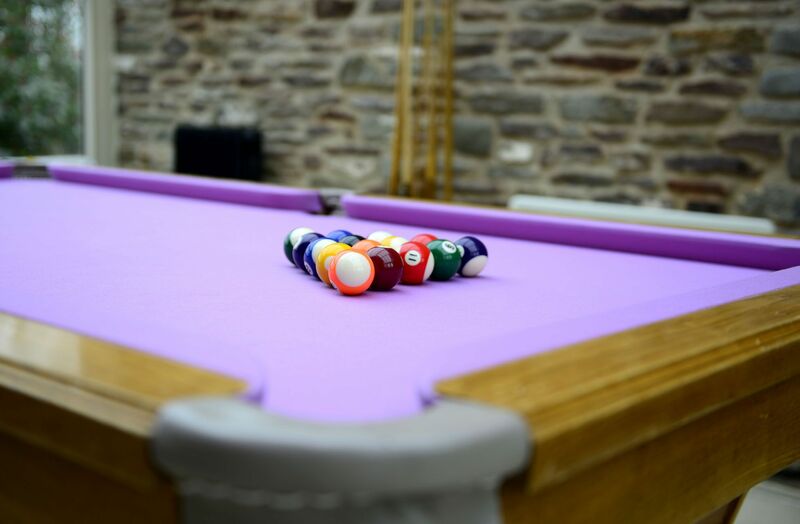 Conservatory Games Room: Featuring a full-size pool table – a sort of ‘grown-up’s den’, designed with the sole aim of giving guests the perfect excuse to have a little fun, kick back and relax. There are doors to the garden. 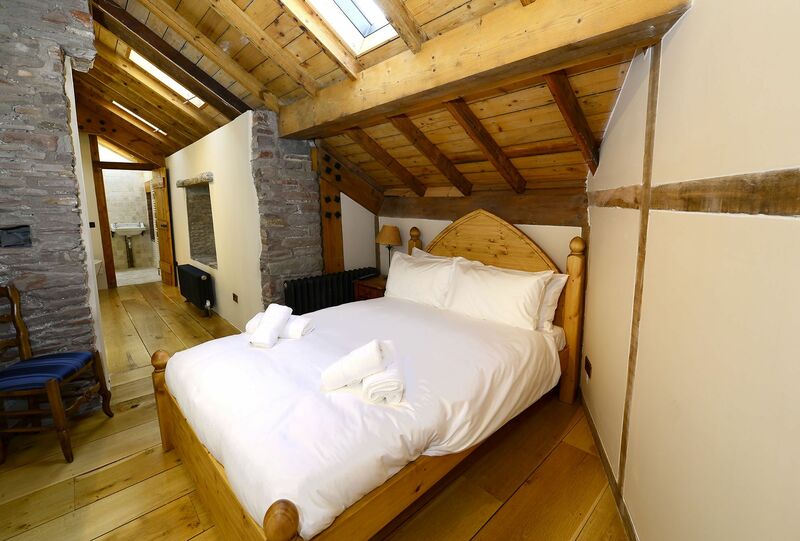 Bedroom 1: With a 5′ lock and link bed which can convert to twin beds, plus an additional two single beds, making an ideal family room and an en suite wet room. 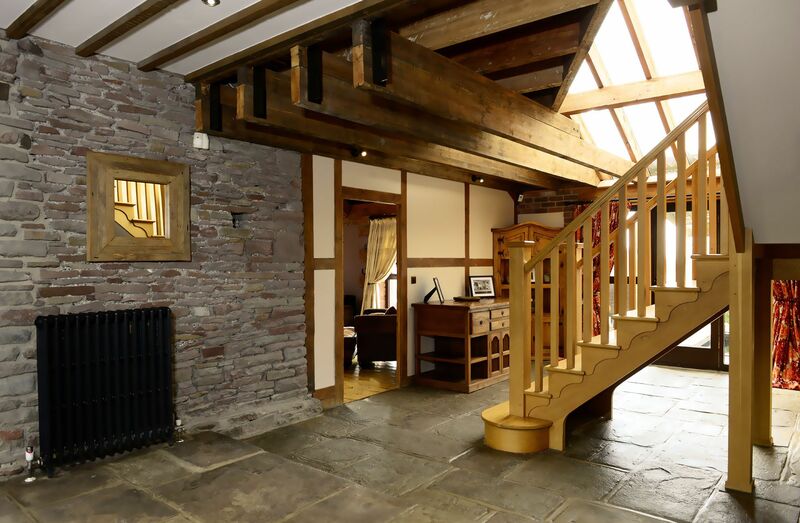 Bedroom 2: A second staircase from ground floor rear hallway leads to the Master bedroom with a 6′ bed and an en suite bathroom with free standing roll top bath and separate shower. 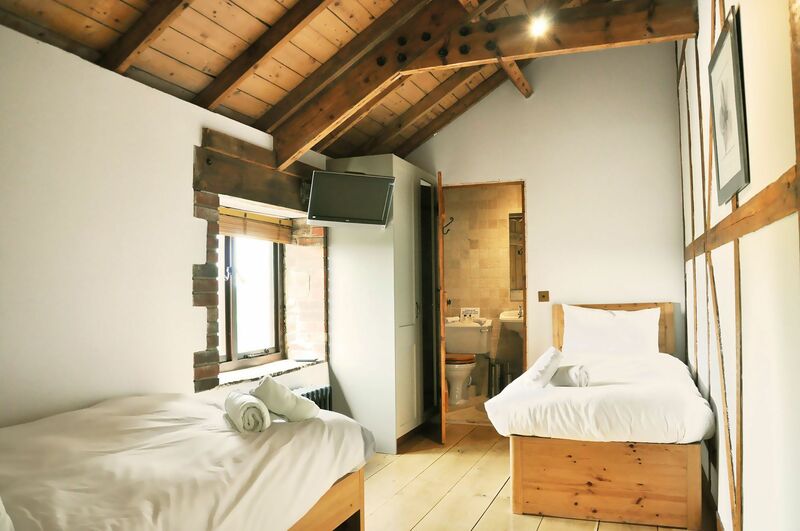 Bedroom 3: Double bedroom with 4’6″ bed, free standing oval bath and an en suite wet room. 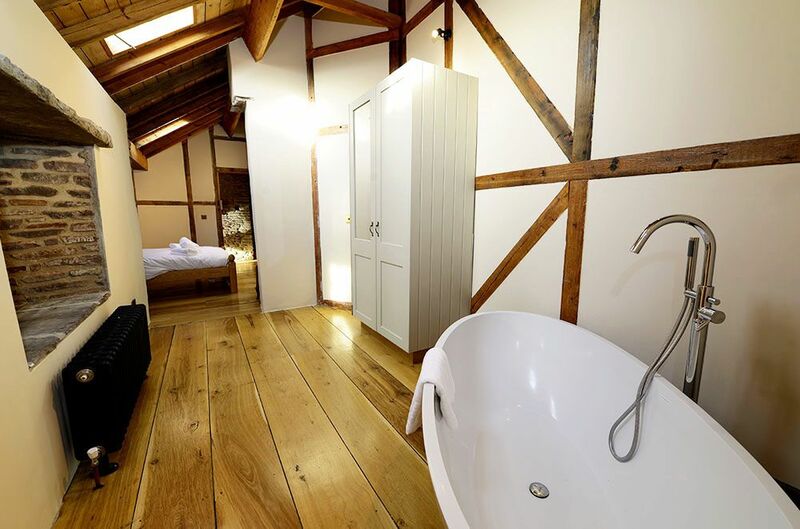 Bedroom 4: Double bedroom with a 4’6″ bed and a 3′ bed, and an en suite wet room. Bedroom 5: Twin bedroom with 2 x 3′ beds and en suite wet room. Bedroom 6: Double bedroom with 4’6″ bed and en suite wet room. Henfield’s exclusive 8-seater Mercedes can deliver guests to the centre of Bath in style and comfort. 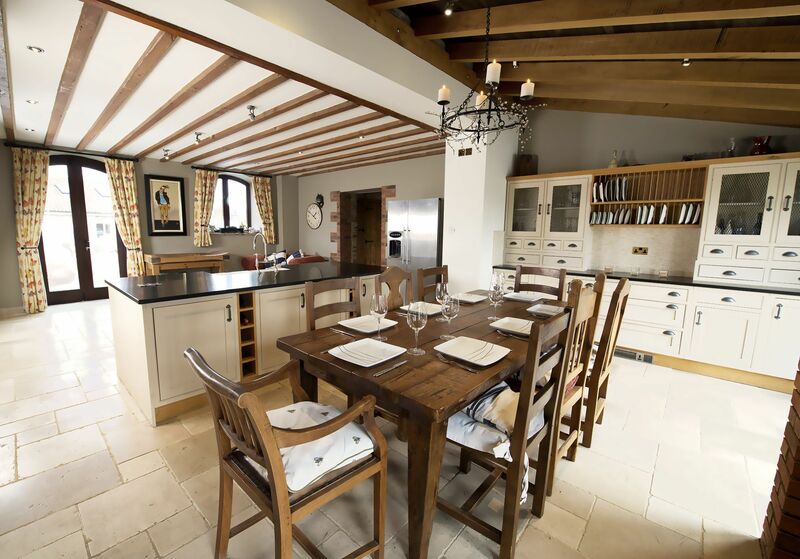 Enjoy restaurant-style dining without leaving the property – Henfield Barn can arrange for a private chef to provide catering during your stay. If you are spending the days running up to your wedding at Henfield Barn, or are hiring the property for some of your wedding guests, a range of additional services can be provided, such as hairdressers and beauty therapists. 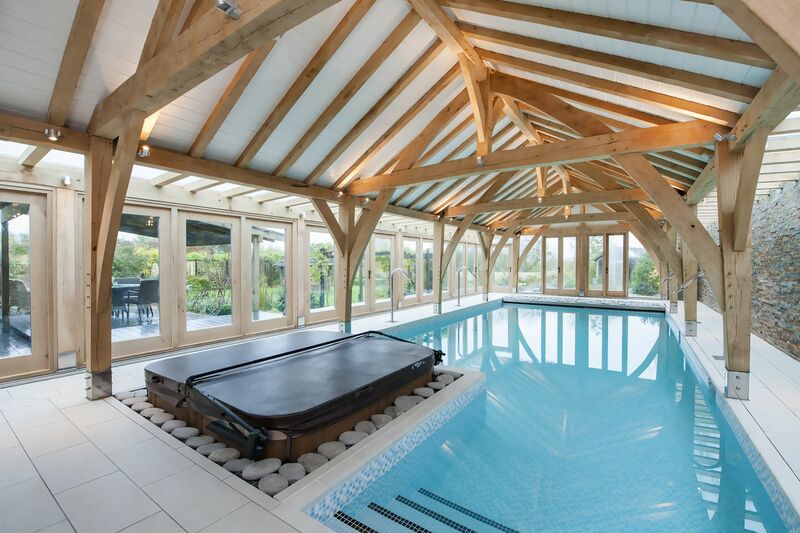 Complete with an indoor heated pool, this spectacular barn conversion has been finished to an extremely high standard, promising complete comfort in glorious Gloucestershire countryside. 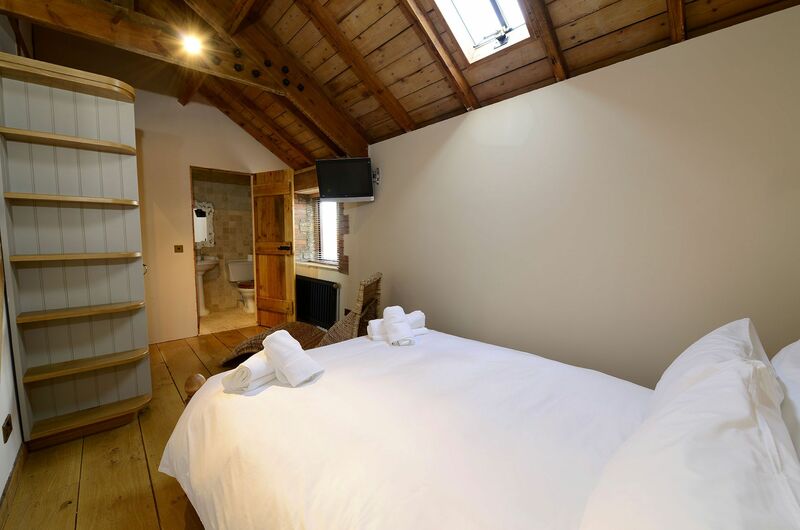 Sleeping 15 in six en suite bedrooms, Henfield Barn promises a relaxing, stress-free getaway for your family or friends. Hankering after an indulgent treat with on-site amenities? 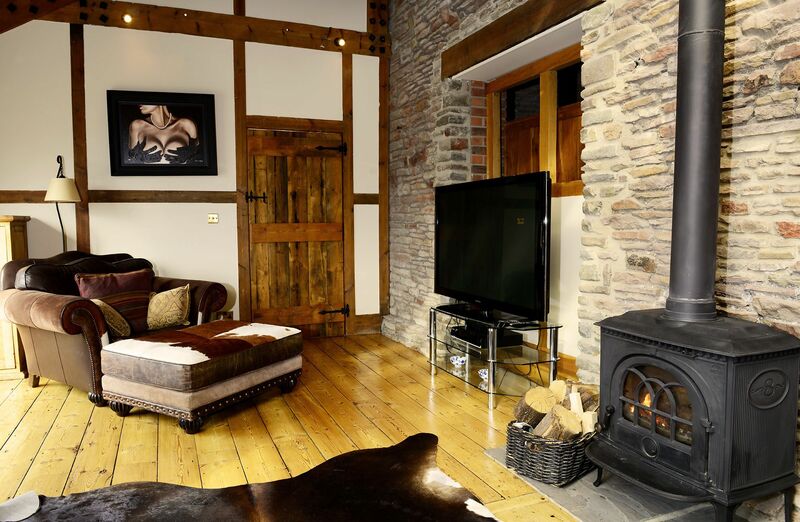 Our rather special property ticks all the right boxes! You can take a dip in the hot tub and dive in to the indoor swimming pool, heated all year round, or relax in the sauna and steam room. 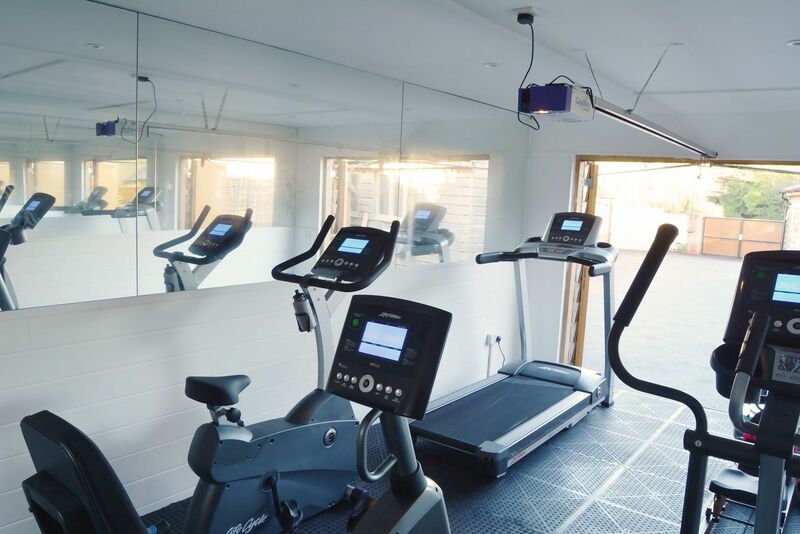 Or perhaps a work out in the gym is more your thing. 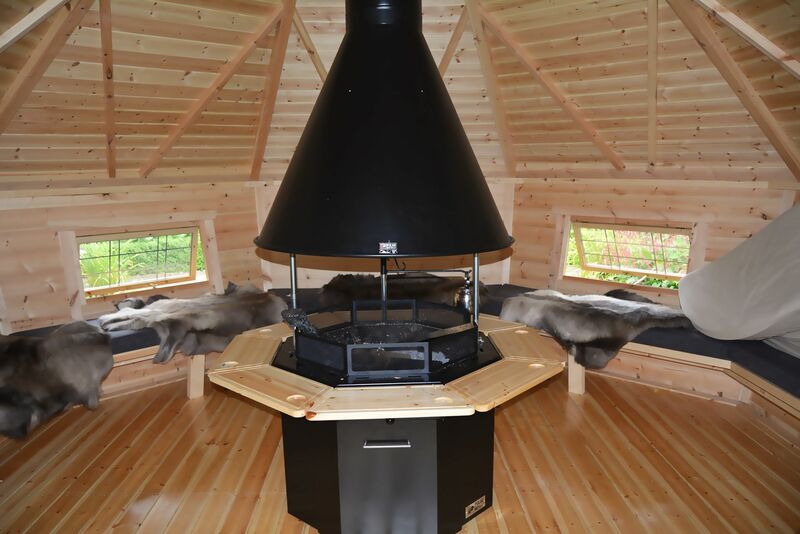 The outdoor Scandanavian Hut, complete with sumptuous reindeer skins, is a fantastic addition to the pretty landscaped grounds. 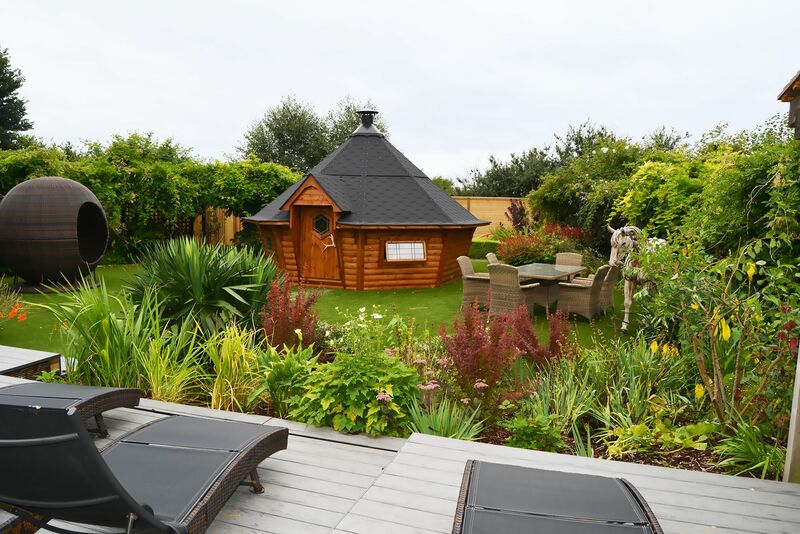 The enclosed gardens also feature a patio area with garden furniture and gas barbecue, an open pond and raised ornamental pond with Koi Carp. 'Paddington Shaun' surveys the goings on with approval. 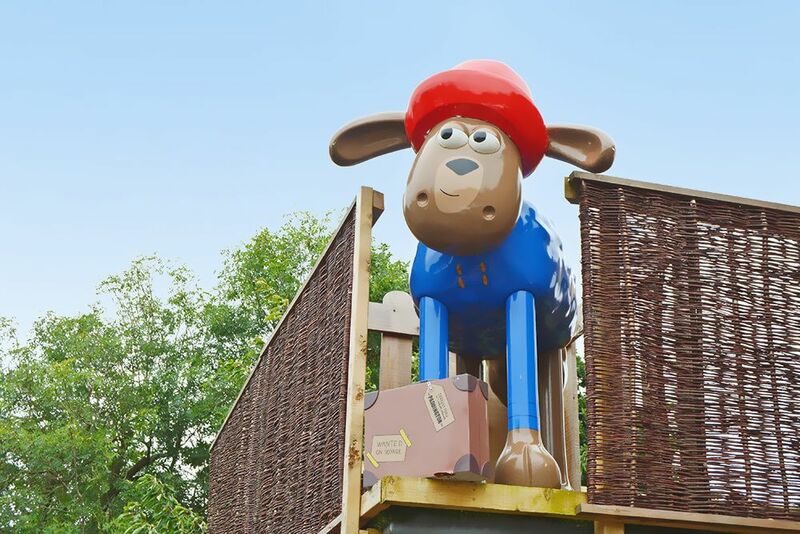 From his unveiling at London’s Paddington Station, he is one of 120 giant sculptures launched for ‘Shaun in the City’ in 2015. He has now ventured to pastures new to make his home at Henfield Barn. A top choice for him and a delight for guests. 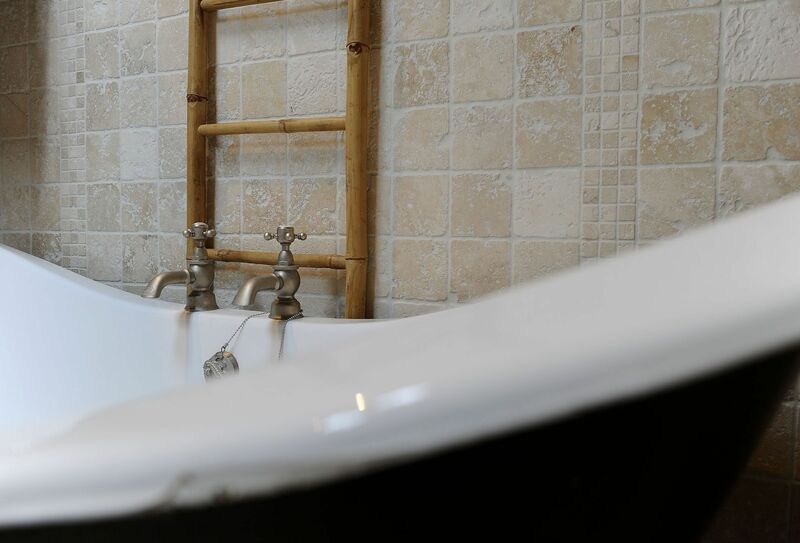 Take advantage of the excellent WiFi access, music system throughout the house and garden and Sky multiroom package. The secure gated entry ensures total privacy during your stay. Check out too the luxurious add-ons to add a bit of extra sparkle to your stay, including restaurant-style dining with a private chef. 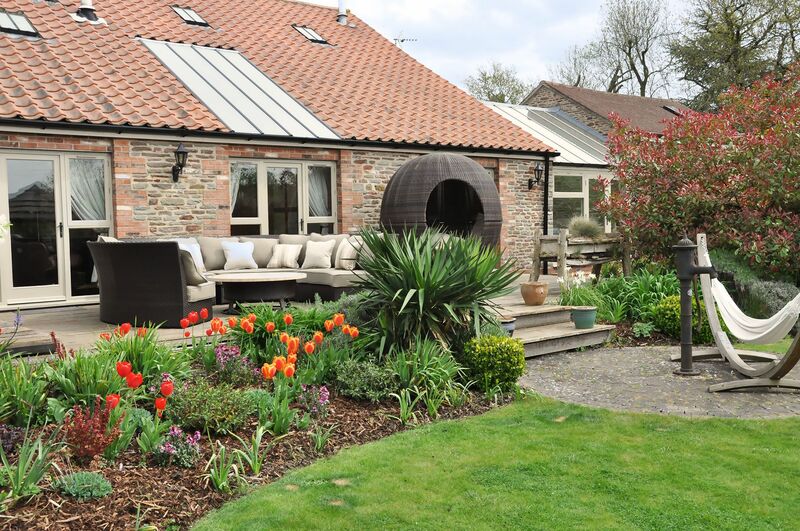 Henfield Barn enjoys the added bonus of being situated close to one of the region’s premier golf clubs – The Kendleshire – an established and well-regarded golf course just a few minutes’ walk from the property. Featuring 27 championship holes spread over 260-acres, the course has been voted a top 10 new course by ‘Golf World’. Take advantage of the special golf packages, created exclusively for guests at Henfield Barn, including special rates. 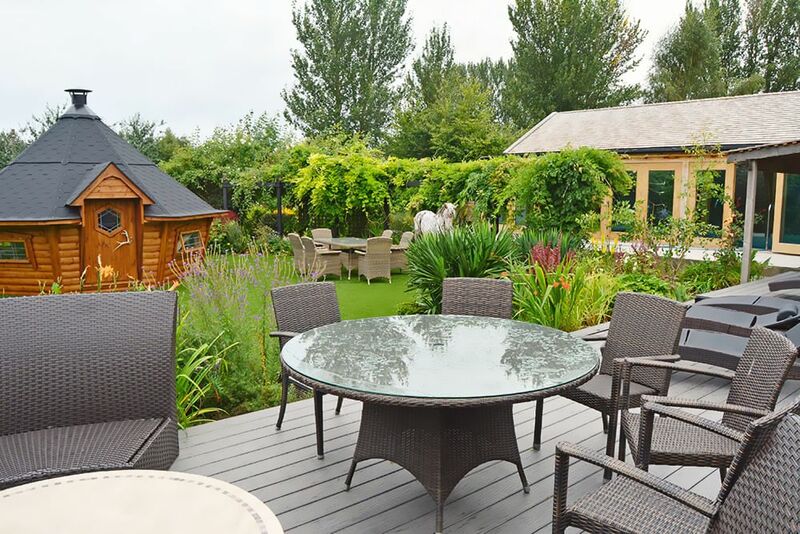 As well as enjoying the luxurious living areas, gardens and leisure facilities, there are plenty of things to do in the area. 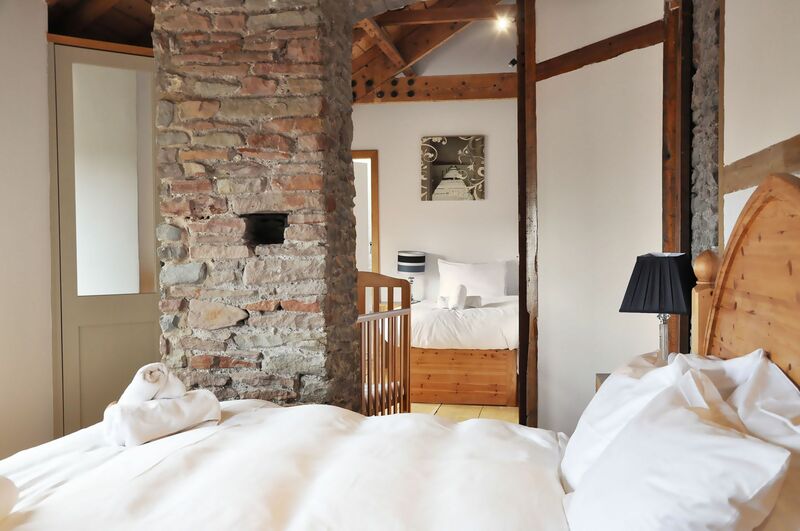 Located in beautiful surroundings, the barn lies in idyllic South Gloucestershire countryside and is within easy reach of the twin centres of the historic cities of Bath and Bristol. Discover the World Heritage city of Bath with its stunning Georgian architecture and unique shops and restaurants. Bath’s attractions include year round festivals and the world-famous Thermae Bath Spa, Britain’s only natural spa where you can indulge yourself under a starlit sky. The city of Bristol has a large number of museums featuring outstanding collections of art and archaeology, geology and natural history. Step on board the world’s first great ocean liner, Brunel’s SS Great Britain, in Bristol’s historic Harbourside. Badminton House and Estate, home of the famous horse trials, is just a short drive away, as is Dyrham Park, 270 acres of ancient parkland with a beautiful 17th century mansion and historic herd of fallow deer. An easy drive takes you to the pretty unspoilt village of Castle Combe, well known for its car racing track, and the quaint National Trust village of Lacock, used in the filming of the BBC serial Cranford. Malmesbury, with its 12th century Benedictine Abbey, The Cotswold Water Park, Westonbirt Arboretum and the Forest of Dean all make a lovely day out. 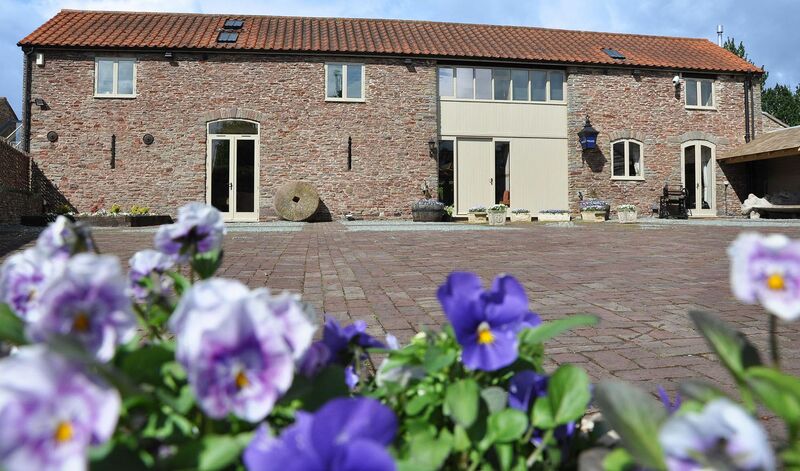 Henfield Barn benefits from easy access, being within convenient reach of both the M4 and M5 motorways, and just 4 miles from the nearest train station. 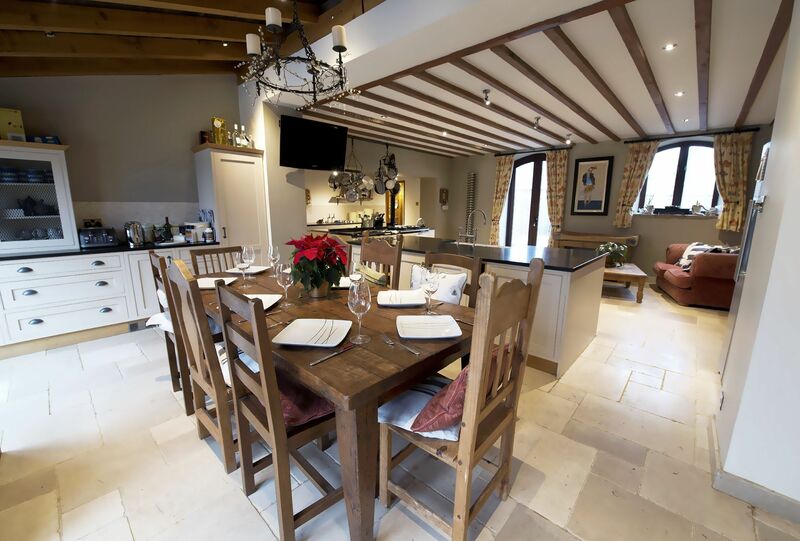 2018-10-26 D Woodhouse, Oxfordshire "An excellent property with wonderful facilities. Very comfortable, clean and well heated and there is so much space. The pool is exceptional. It is ideal for all groups - ours ranged in age from 18 months to 97 years!" 2018-02-16 R Cave, London "Beautiful house. Outstanding facilities. The swimming pool is amazing. Great hosts. From 18 months old to 70 years old we all had a great time." 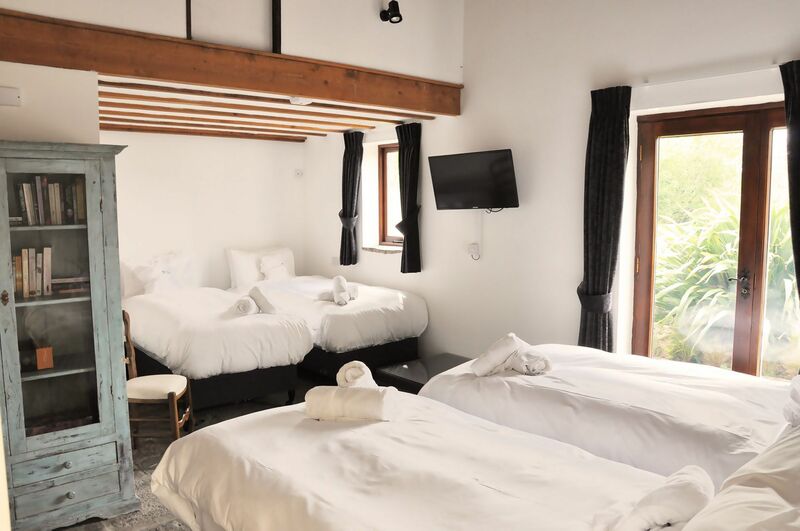 Discover the quaint villages, peaceful countryside and traditional pubs that characterise the surrounding region or take a drive a little further afield to picturesque Cotswold villages and bustling market towns. Experience the unique ambience of Bristol, where you’ll find a rich cultural landscape that takes in everything from Banksy’s world-famous street art to the industrial heritage of Brunel, eclectic shopping to Georgian architecture. SouthGate quarter boasts over 55 high-street stores and restaurants, including big names such as Apple Store, Superdry, Kurt Geiger and Topshop. For a mix of designer shopping, homewares, cafes and restaurants head to Milsom Place where you’ll find retailers including Cath Kidston and Ted Baker, plus a bustling Jamie’s Italian. For something totally different try the atmospheric The Corridor, a covered colonnade packed with quirky independent shops selling everything from homemade fudge to designer jeans. But there’s much more to Bath – a stroll along any of its side streets and lanes will reveal some lovely artisan producers, handmade jewellery shops, and interesting antique showrooms, packed with unusual, quirky pieces. For a comprehensive range of big name brands look no further than Cabot Circus, located in the Broadmead district of Bristol. Flagship stores include House of Fraser, Zara and Urban Outfitters, alongside smaller retailers, a deluxe cinema and a host of cafes and restaurants. Quaker’s Friars is home to some of the most luxurious shopping in the city, including Harvey Nichols (and 5th Floor Restaurant), Reiss, French Connection and The White Company. There’s also an outpost of the acclaimed London bookshop Foyles. For a more unique shopping experience head over to the Georgian suburb of Clifton Village, where you can browse unusual independents, upmarket boutiques and stop for a coffee and cake at some of the city’s prettiest cafes – try the Primrose Café or the Arch House Deli & Café. A 20 minute drive will take you to The Mall at Cribbs Causeway featuring big name retailers such as John Lewis and M&S, Apple and Molton Brown, as well as leisure facilities such as a 12-screen Vue Cinema and Hollywood Bowl. If outlet shopping is your thing, make a trip to Gloucester Quays, around 45 minutes from Henfield. This expansive development is the perfect place to track down a bargain or two and features stores including LK Bennett, Calvin Klein, The White Company, Le Creuset and Nike, as well as eating options such as Costa Coffee and Pizza Express. For more outlets, you can visit Swindon Designer Outlet, just 40 minutes away. You’ll find over 90 leading brands such as Kurt Geiger, Hugo Boss and Levis. You’ll even be able to indulge your sweet tooth with chocolatiers like Cadbury, Lindt and Thornton’s. Henfield Barn overlooks the 2nd green of The Kendleshire Golf Club so you could not be better situated. Kendleshire’s greens have water on many of the holes, offering an added challenge for golf buffs. The number of holes at the Kendleshire allows you to play three different courses – combined that makes no less that 54 holes! Of course, no trip to the golf club is complete without a stop at the club house and Kendleshire’s has all the comforts you’d expect from a top club, plus a sunny terrace overlooking the 18th green. In addition to the Kendleshire-only package, you can see what other local courses have to offer. You can combine a round at Kendleshire with a trip to The Player’s Club, located 7 miles away, or Cumberwell Park, situated just outside Bath. 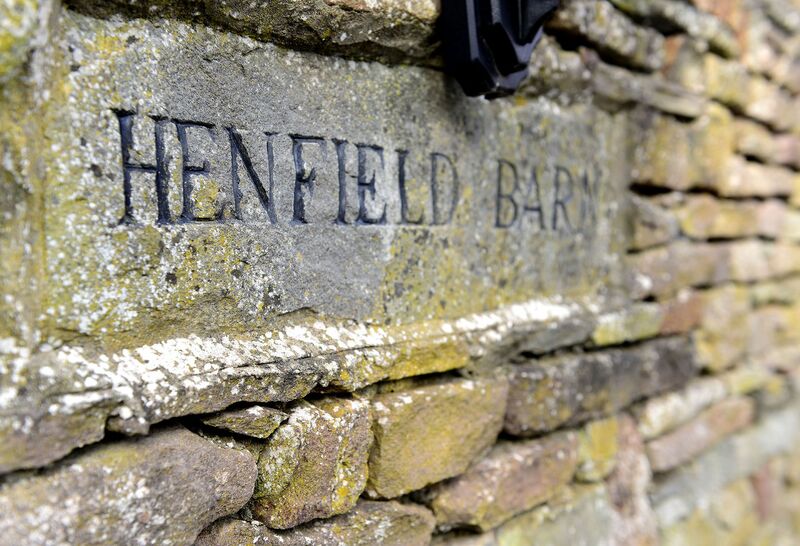 The expert team at Kendleshire have picked these venues not just for their proximity to Henfield Barn, but for their exceptional quality and warm welcome. They will be delighted to help you with any aspect of your golfing arrangements during your stay at Henfield, and can help you create your very own bespoke golfing package at alternative venues if you prefer. 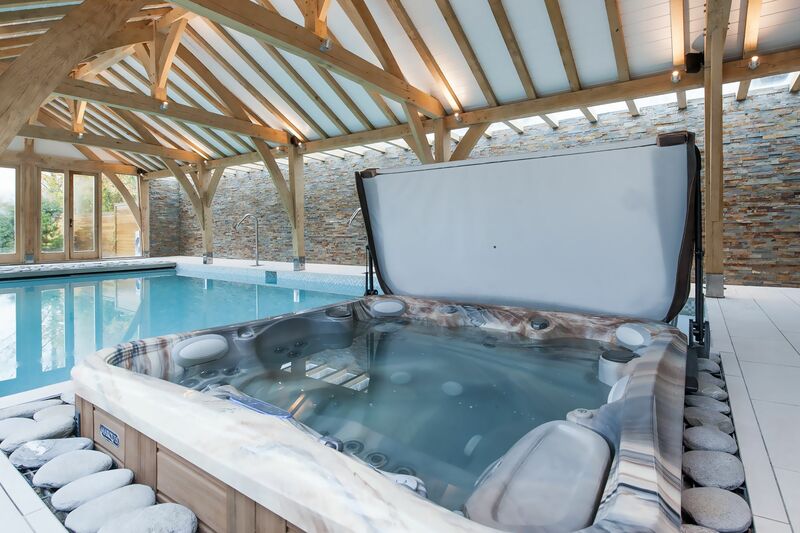 For the ultimate in relaxation we can arrange for beauty therapists to create an in-house spa experience for you at Henfield Barn, the perfect treat for your hen party or girls’ weekend. 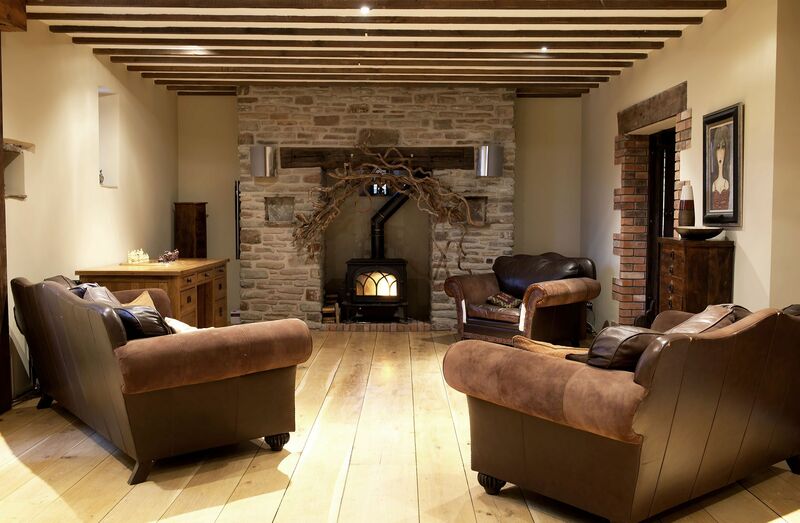 Indulge yourself with a choice of relaxing body and beauty treatments without leaving the comfort of our warm and cosy barn – what could be nicer than having a treatment before curling up on our comfy sofa for an afternoon nap? Or combine a treatment with a dip in our re-invigorating Jacuzzi… Pure heaven! With the culture-rich cities of Bath and Bristol on your doorstep there’s plenty to explore on excursions from Henfield Barn. The Roman Baths and the well-preserved architecture of The Royal Crescent are obvious attractions, or you could take in some top-class theatre at the city’s Theatre Royal. Komedia, meanwhile, is an award-winning venue hosting comedy, cabaret and music nights. 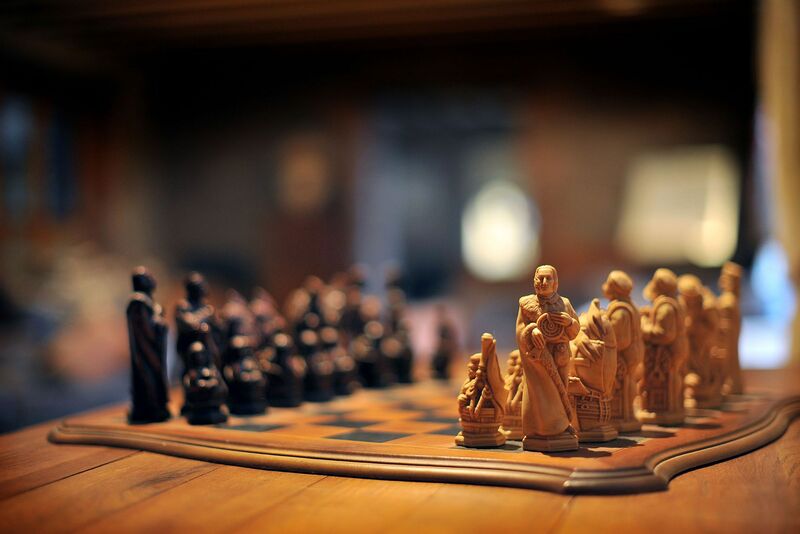 The American Museum at nearby Claverton Manor makes for an interesting visit, or you could hire a bike and explore the gorgeous scenery along the Kennet and Avon Canal towpath. Bristol can boast some impressive historical landmarks, too, in the shape Brunel’s awe-inspiring Clifton Suspension Bridge and his beautifully restored steamship, the SS Great Britain. For contemporary art don’t miss the achingly hip Arnolfini, while just across the river you’ll find the Watershed, one of the city’s major cultural hotspots where you can catch indie and art-house films, see an exhibition or grab a drink overlooking the docks. The city’s major theatres and concert halls include the Bristol Old Vic, the Colston Hall and the Tobacco Factory, while more mainstream touring productions are on offer at the Bristol Hippodrome. Avon Valley Railway, Bitton Station, Bath Road, South Gloucestershire (7 miles). Steam trains run right to the edge of the scenic Avon Valley, providing spectacular views. Special events are arranged throughout the year – please check their website for details. Dyrham Park (8 miles), owned by the National Trust, offers 270 acres of ancient parkland, with breathtaking views, landscaped gardens, a beautiful 17th century mansion, tea room and historic herd of fallow deer. Avon Valley Adventure & Wildlife Park, Keynsham, Bristol (9.8 miles). The park covers 50 acres of beautiful countryside adjoining the River Avon providing country walks, a boating lake, play areas for children, a small petting zoo and a miniature railway. The Wild Place Project, Blackhorse Hill, South Gloucestershire (10.3 miles). A wildlife park with animals from Madagascar, east Africa and the Congo on the outskirts of Bristol. The Wild Place Project is the first stage in the creation of a much bigger wildlife conservation park. An extension to Bristol Zoo, visitors will see much larger animals than those which can be housed at the small city zoo. Badminton House and Estate (11 miles), home of the famous horse trials, is just a 20 minute drive away. 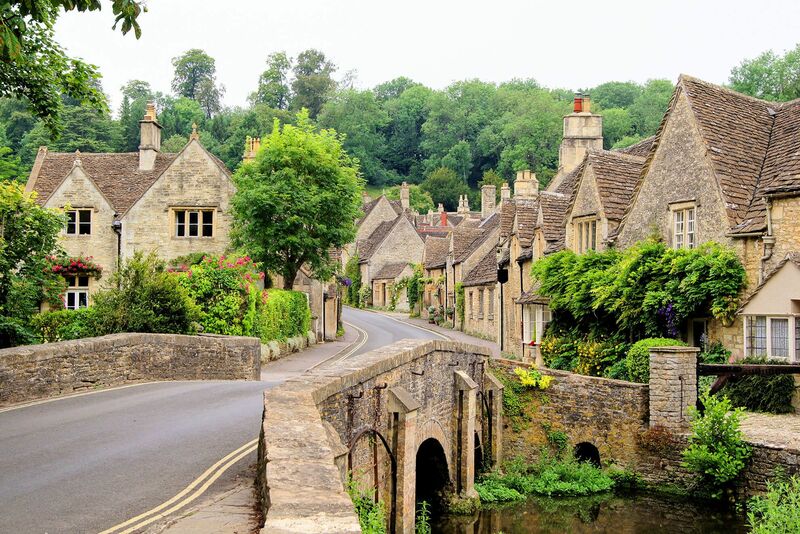 Castle Combe (13 miles), called ‘The Prettiest Village in England’ and well known for its car racing track, and the quaint National Trust village of Lacock (22 miles) famous for its picturesque streets, historic buildings, Abbey and Museum and more recently as a TV and film location. Malmesbury, (19 miles) is rightly called the “Queen of Hilltop Towns” being England’s oldest borough with a rich history over 1000 years. Set on a hill, circled by the River Avon, the skyline is dominated by the imposing Norman Abbey. 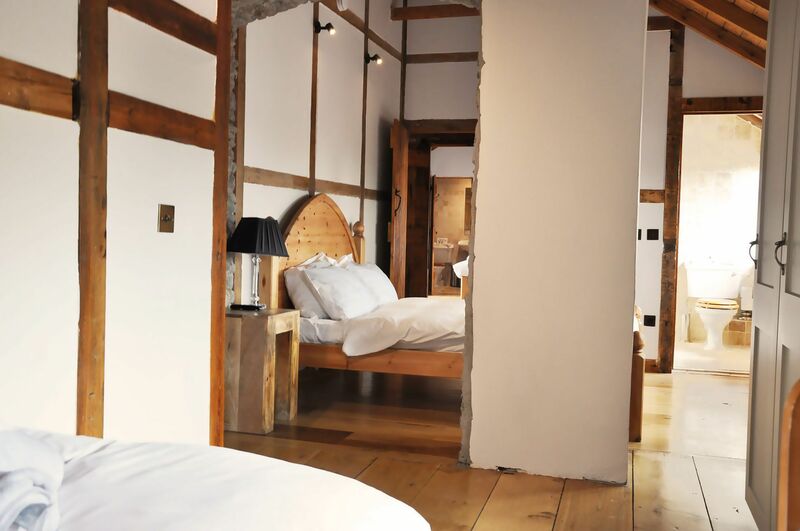 The historical sites of the town, the fine 15th century Market Cross, the Old Courtroom and Almshouses, narrow medieval streets, quaint alleyways and the riverwalk can easily be discovered on foot. Internationally renowned, Abbey House Gardens offer a romantic and unique oasis in the centre of town. Many of the town’s restaurants and shops serve succulent, locally produced produce in atmospheric surroundings. Unusual, independent retail outlets offer plenty of shopping opportunities. Chavenage House (20 miles) is an Elizabethan house containing furniture, pictures and relics of Cromwellian period, amid the tranquil Cotswolds. 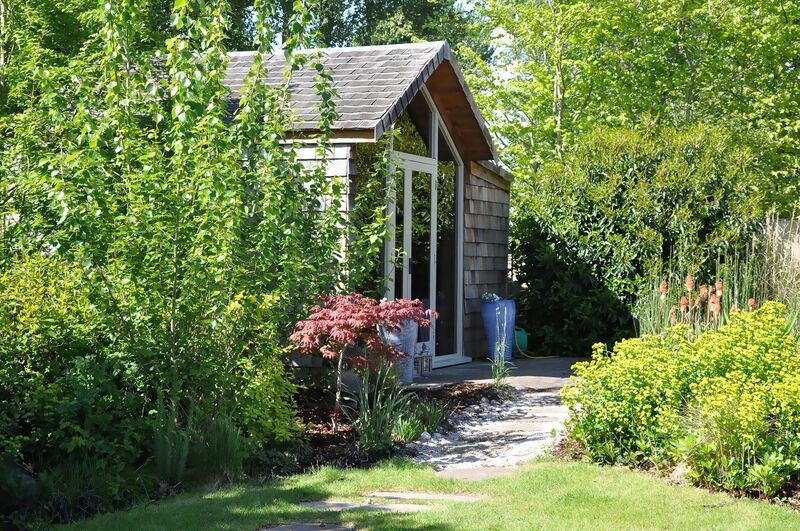 There are spacious gardens with unspoilt views and tours are conducted by owner or his family. 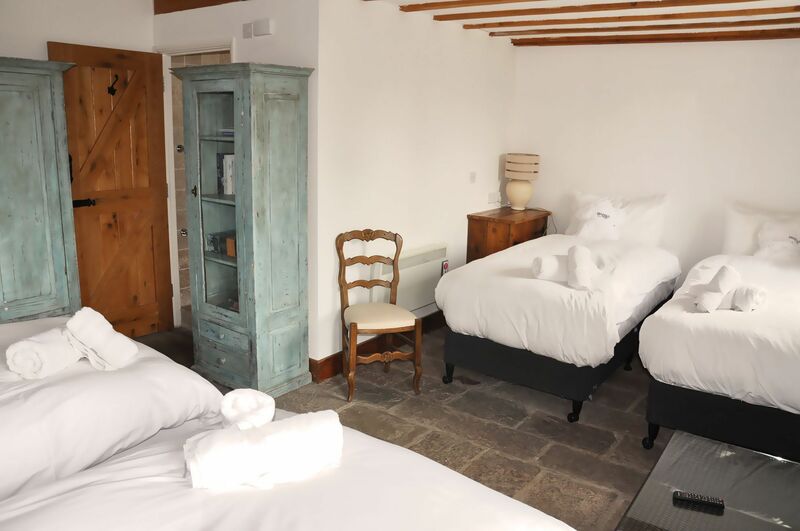 Featured in Poldark, BBC2’s Curious House Guest and as Candleford Manor in the costume drama Larkrise to Candleford, amongst many others, it is a hidden gem of the Cotswolds. The Cotswold Water Park (31.5 miles). With more than 150 lakes spread over forty square miles, there is something for everyone – from angling to archery, watersports to walking, birdwatching to biking, to name just a few things. Botteginos has developed a fine reputation for the very best in Italian dining – from the satisfying snack, important business lunch, special evening dinner to private party. They have always insisted on the highest standards using only the freshest ingredients and herbs. Their authentic pastas are especially imported from Italy and our top quality meat, chicken and fish are all cooked using our own traditional recipes, guaranteed to produce the fullest flavours with the taste of Italian home cooked food. Just like our Mama still makes! This fabulous restaurant is one of its kind offering 96 seats in superior surroundings. The restaurant specialises in all types of Indian cuisine. Some of the dishes are unique to the Tamarind only and lots of customers ask to take the secret recipes home as they are so delicious. 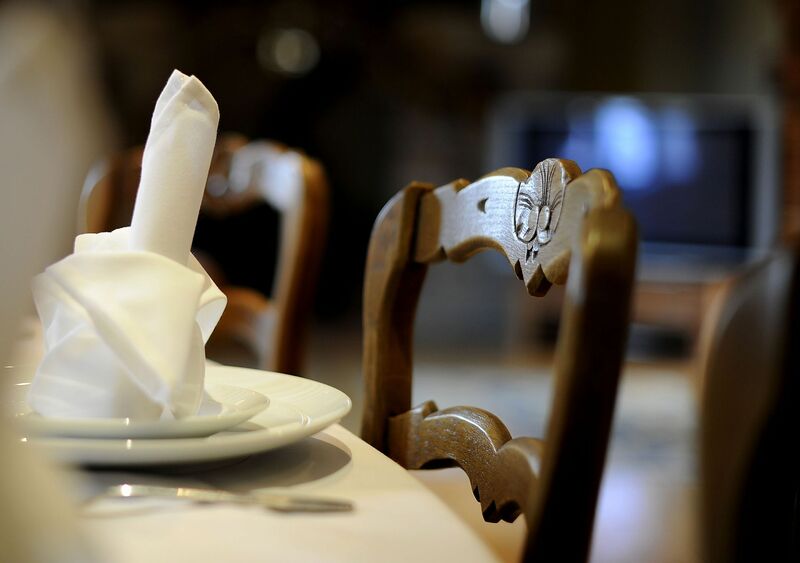 The Swan Inn embrace the principle of good food in relaxed surroundings and have always endeavoured to use the freshest and best of ingredients and buy locally wherever possible. Whilst their Evening Menu is fantastic, the Specials Board is where their chefs get all creative so we would definitely recommend you have a look at the specials before ordering! If you are looking for a quick, satisfying lunchtime meal, try one of their ciabatta rolls. For those with a bit more time and a bigger appetite, their New Fixed Price Lunch Menu represents superb value for money and offers some of our best dishes at superb prices. Or you may just want to enjoy a glass of wine or local ale on one of their bar stools and enjoy the friendly, welcoming bar atmosphere. Children are more than welcome at The Swan – they have plenty of high-chairs and of course a special menu for the little ones too! Just six miles from Bristol City Centre, this charming countryside pub is a welcome respite from the busy city. The Folly is the perfect place to come and experience a tranquil afternoon, sitting on the heated patio listening to the Folly Brook running alongside. Top this off with home cooked pub food, choosing from traditional to more continental meals and a wide range of specials. 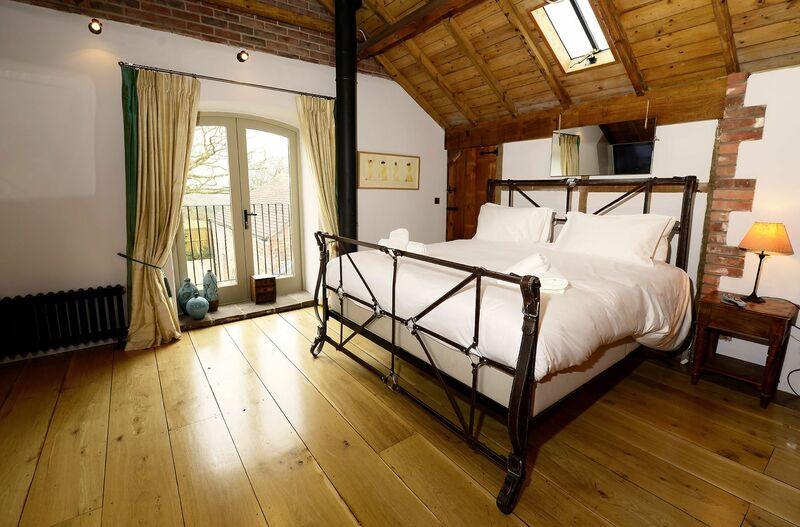 The Folly is the perfect way relax and escape the hustle and bustle. Simply put, The Golden Heart in Winterbourne Down is a fabulous village pub and restaurant serving up tasty, top-notch food alongside an eclectic range of wines and cask ales in cosy, stylish surroundings. After-dark drinking haunts range from the cluster of cosy pubs around Cotham and Clifton to sophisticated cocktail lounges and members’ clubs –try Goldbrick House for the city’s most imaginative cocktail lists. With over a decade of experience as a personal and private chef around the world, Tyrone is able to offer a professional and discreet service. His passion and ability to be able to tap into the best local produce and use his contacts all over the world means that he can create a menu truly unique to the situation at very short notice and with the minimum of fuss. Should you wish to book Tyrone please go to his website for further information. Tyrone does not provide a set menu but charges a day rate plus the cost of food to create a menu that best suits your own individual requirements. This means that prices will vary so please contact him directly for a quote. If you would like catering, please give as much notice as possible so we can ensure the caterers are available for the dates you require. Eggleton’s career started at his local chippie when he was 15. After becoming a Gordon Ramsay Scholar in 2003 (which allowed him to take in the culinary cultures of Sicily, America and France), he turned down jobs with the likes of Ramsay, Angela Hartnett and Marcus Wareing to return to Chew Magna near Bristol and transform The Pony & Trap’s kitchen into what it is today. 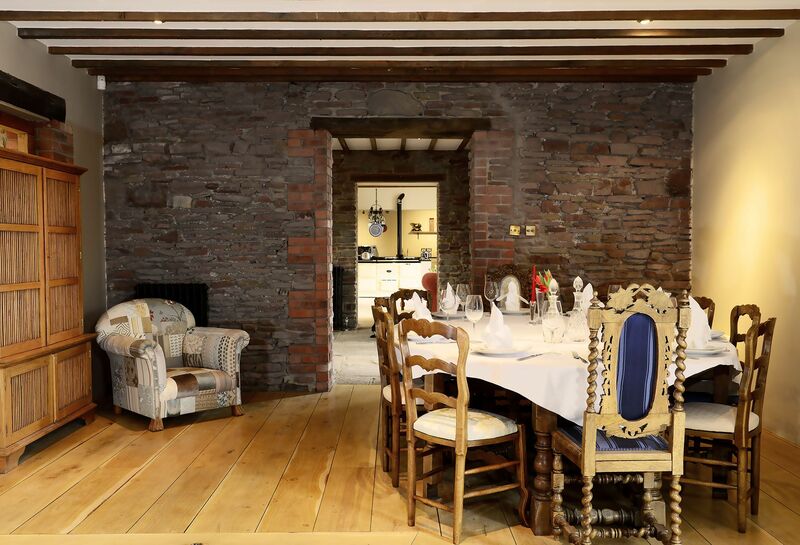 He acquired The Pony’s freehold in 2009 and unsurprisingly – since Eggleton won Somerset’s only gastropub Michelin star – business is better than ever. The restaurant ticks along smoothly, with Josh’s sister, Holly, taking care of front of house duties. The Pony & Trap is unique in that Eggleton likes to make sure his customers know where all his main ingredients come from. Eggleton has outlined his commitment to artisanship; bucking the trend for all things molecular by going back to making as much as he can in-house. As for the food itself, as Caterer Search observes, “The menu seems simple but there is a great deal of effort involved in each dish”. No wonder The Michelin Guide said Eggleton ‘shows a real understanding of ingredients and flavours’. His recipes are both simple and highly playful – his Pimms jelly is served with a cucumber sorbet while scallops wrapped in bacon, a dish he has titled “scallop pops”, come served on cocktail sticks. Eggleton made his debut on Great British Menu in 2014, competing against Emily Watkins and Dominic Chapman in the South West heats. A multi-award winning professional chef with over 25 years experience as both a chef and restaurateur. Make your holiday more memorable and relaxing by engaging Jonathan to provide your party with the highest quality restaurant experience. He is able to provide everything from simply breakfast to lunch, dinner, canapés or Barbecue. Using only the finest local ingredients and creating bespoke menu’s for your stay. He draws on his experience in some of the UK’s best restaurants and time in the Caribbean. Interactive cookery classes and workshops can also be catered for – please contact for details. A private chef would create and agree with the client a menu. They would prepare, cook and clean down the kitchen, the chef purchases all required ingredients and is included in the price. Staff could be provided to serve the meal (at extra cost). A private chef would create and agree menus for 2 meals per day, either breakfast & lunch, breakfast & dinner or lunch & dinner. They would prepare, cook and clean down the kitchen, the chef purchases all required ingredients and is included in the price. Staff could be provided to serve the meal (at extra cost). A private chef would create and agree menus for 3 meals a day, could also include afternoon tea’s, cakes etc. They would prepare, cook and clean down the kitchen, the chef purchases all required ingredients and is included in the price. Staff could be provided to serve the meal (at extra cost). Cocktail Clinic – A personal fun training session to teach you about cocktails and how to make them. Experts in etiquette, “Butlers in the Buff” will transform any party or event – whether it’s a corporate event, a birthday celebration, hen night or just a girl’s night in – into a truly memorable evening. Sherry & Mince Pie Specials at Avon Valley Railway, Bitton Station, Bath Road, South Gloucestershire (7 miles). Bristol’s Winter Wonderland at The Mall at Cribbs Causeway (6.8 miles). Bath on ice, Royal Victoria Park, Bath (14 miles). Bristol Jazz and Blues Festival, Bristol (9 miles). Bath Comedy Festival, Bath (14 miles). Enchanted Easter, Wild Place Project, Blackhorse Hill, South Gloucestershire (10.3 miles). Easter family fun, Bristol Zoo (9 miles). Noah’s Easter Egg Hunt, Noah’s Ark Zoo Farm, Wraxhall (15.6 miles). Bristol Folk Festival, Bristol (9 miles). Tetbury Wacky Races, Tetbury (20 miles). Badminton Horse Trials, Badminton (11 miles). Paddington Family Fun Weekend, Avon Valley Railway, Bitton Station, Bath Road, South Gloucestershire (7 miles). Nailsworth Festival, Nailsworth (20 miles). The Bath Festival, Bath (14 miles). VegFest UK, Bristol (9 miles). Bath Fringe Festival, Bath (14 miles). Chippenham Folk Festival, Chippenham (21 miles). Tetbury Woolsack Races, Tetbury (20 miles). The Royal Bath & West Show, The Showground, Shepton Mallet, Somerset (28.5 miles). Let’s Rock Bristol!, Ashton Court Estate, Bristol (11 miles). Bristol’s Big Green Week, Bristol (9 miles). Bristol Shakespeare Festival, Bristol (9 miles). Bristol Harbour Festival, Bristol (9 miles). WOMAD, Charlton Park, Malmesbury (24 miles). Festival of British Eventing, Gatcombe Park (23 miles). South Gloucestershire Show, The Windmill Fisheries Showground, Westerleigh Road, BS37 8QZ (1 mile). Bristol International Balloon Fiesta, Ashton Court Estate, Bristol (11 miles). Bath Folk Festival, Abbey Chambers, Abbey Churchyard, Bath (14 miles). Tortworth Vintage Rally, Showground off the B4509, Wickwar, GL12 8LF (10 miles). Bristol International Kite Festival, Durdham Downs, Stoke Road, Bristol BS9 1FG (9 miles). The Jane Austen Festival, Bath (14 miles). Tetbury Music Festival, Tetbury (20 miles). Bath Children’s Literature Festival, Bath (14 miles). Malmesbury Carnival, Malmesbury (21 miles). Annual Open Exhibition at RWA, Royal West of England Academy of Art, Queen’s Road, Clifton, Bristol (9 miles). Great Bath Feast, Bath (14 miles). Circus City Festival, Bristol (9 miles). A biennial contemporary circus festival across Bristol. End of Season Gala, Avon Valley Railway, Bitton Station, Bath Road, South Gloucestershire (7 miles). Halloween at Avon Valley Country Park, Keynsham, Bristol (9.8 miles). Spooky Half Term Train Rides, Avon Valley Railway, Bitton Station, Bath Road, South Gloucestershire (7 miles). Halloween Festival at Wild Place Project, Blackhorse Hill, South Gloucestershire (10.3 miles). Annual Open Exhibition at RWA, Royal West of England Academy of Art, Queen’s Road, Clifton, Bristol (20 miles). Bath Film Festival, Bath (9 miles). Bath Rotary Club Fireworks Display, Bath (14 miles). Novemberfest Beer Festival, Avon Valley Railway, Bitton Station, Bath Road, South Gloucestershire (7 miles). Bath MozartFest, Bath (14 miles). Bristol German Christmas Market, Broadmead, Bristol (9 miles).20 Bath Artisan Christmas Market, Green Park station, Bath (14 miles). Gloucester Quays Victorian Christmas Market, Gloucester Quays (33 miles). Bath Christmas Market, Bath (14 miles). Santa Specials, Avon Valley Railway, Bitton Station, Bath Road, South Gloucestershire (7 miles). Made in Bristol Gift Fair, Colston Hall, Bristol (9 miles). Bristol German Christmas Market, Broadmead, Bristol (9 miles). Santa Specials, Avon Valley Railway, Bitton Station, Bath Road, South Gloucestershire (7 miles). Selected dates. Bath Artisan Christmas Market, Green Park station, Bath (14 miles).